Wirelessly send designs with EmbroideryWorks and Creator Software Programs from your computer to your embroidery machine. Compatible with PC and Mac. 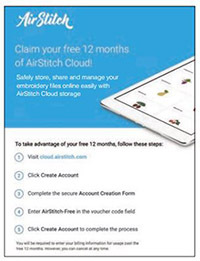 Enjoy 12 months of free cloud storage for your design collection with purchase of AirStitch from Designer’s Gallery. Airstitch requires Designer’s Gallery EmbroideryWorks Everyday, EmbroideryWorks Advanced or Creator Levels 1, 2 or 3 to operate.